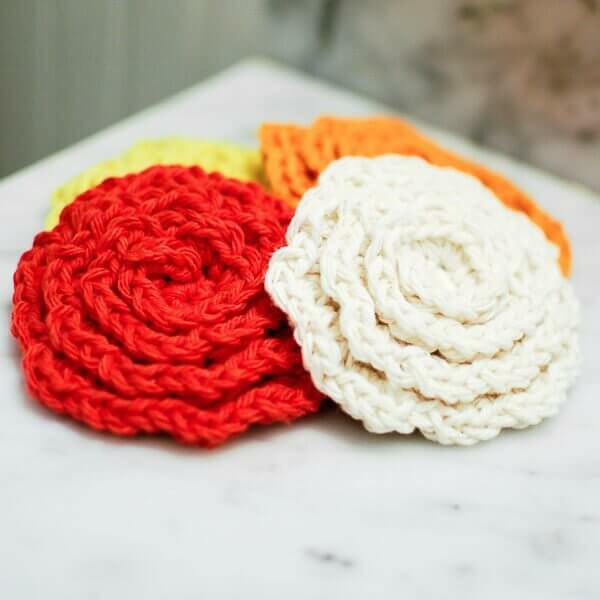 These crochet flower face cleansing pads add a pretty flare to your beauty routine. They are attractive enough to be displayed while being soft and absorbent enough to cleanse. They also make for a great gift when paired with a scented soap and lotions. They are lots of fun and quick and easy to do! Where possible I include links to the products and resources I mention. Some of these links may be affiliate links, which means I may receive a small commission on purchases at absolutely no additional cost to my readers. My full Disclosure Statement is here. 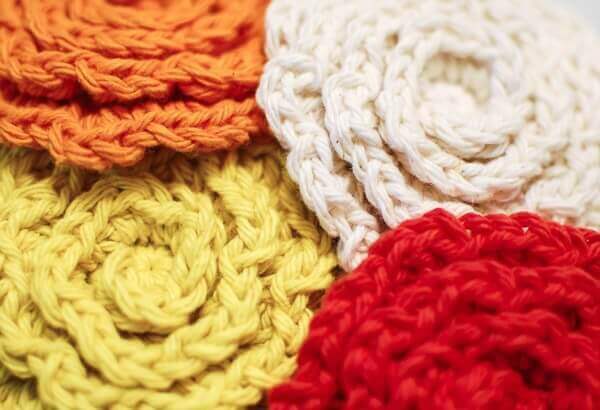 Resources and tutorials you may find helpful in following this pattern: Crochet Abbreviations, U.S. to U.K. Crochet Conversion Chart, How to Make a Magic Ring (see video below). 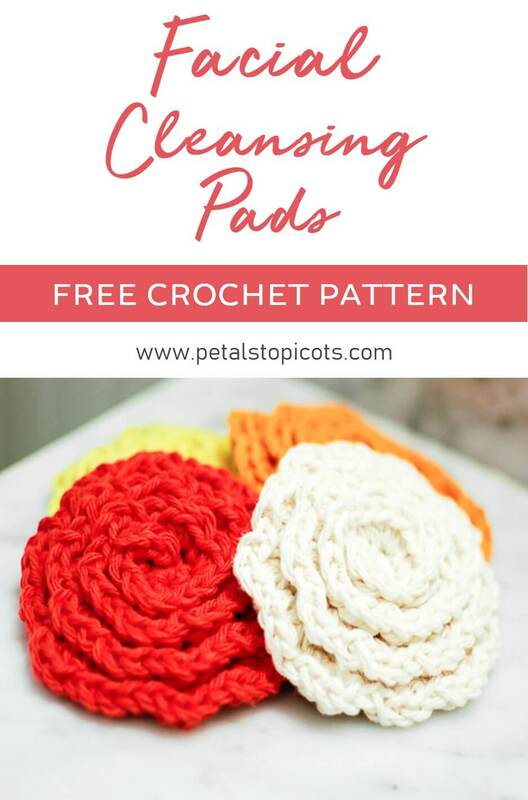 Note: These Crochet Flower Face Cleansing Pads are worked in unjoined rounds. Use a stitch marker to keep track of rounds. Round 1: Ch 1 (does not count as st), work 6 sc in ring, do not join here and throughout — 6 sts. Round 2: Work 2 sc in each st around — 12 sts. Round 3: *2 sc in next, 1 sc in next, rep from * around — 18 sts. Round 4: *2 sc in next st, 1 sc in each of the next 2 sts, rep from * around — 24 sts. Fasten off. Join yarn in first unworked loop from Round 1, work 1 sc in same loop as join, *3 hdc in next, 1 sc in next, rep from * around, Sl st in next and fasten off. Weave in ends. Thanks so much for your beautiful pattern. I got it. I love it a lot. I’m ginna make more ad gift fro friends. Not a very well written pattern. You should have said to continue around on each row. I am not a beginner but I had a few people who are ask me what they do after they finish the first row of hdc’s. Yes, I know for you it is a no-brainer, but for those who are just starting out, you should have explained that. I love this pattern! I’m going to use it to add flowers to a baby blanket for a baby shower! So quick and easy! After the first fasten off, I was then lost! Don’t understand where that last row goes after you fasten off, or why?! Do you have a tutorial? Hi Diane 🙂 After fastening off at the end of Round 4, you will rejoin your yarn to the center of your flat circle in the innermost loop, or the front loop of the very first stitch you made. Then continue working in the front loops of all the stitches around. Hope that helps! It sounds a little like you might be turning to work as you would in rounds, is that the case? If so, then that is why you are getting a semicircle. Instead, do no join at the end of Round 1, but instead, continue working in the round by working your first stitch of Round 2 directly into the first stitch from Round 1. Make sense? For the life of me…i have no idea where my first unworked loop is after completing r4. Should i have used a stitch marker at the beginning? Hello 🙂 The first unworked loop is the one at the very center of your circle. Then you would work your way around outwards. Hope that helps! Can you show a picture of what it looks like before you tie off? Unfortunately, I do not have a photo. I’m a knitter new to crochet – I’ve tried this 4 different times, but mine keep coming out pretty flat. I’m not understanding what you mean by “back loop.” Is there a video tutorial for this? I see others have had the same problem… I will try again… Thanks. Be sure you are doing this part too 🙂 … Fasten off. Join yarn in first unworked loop from Round 1, work 1 sc in same loop as join, *3 hdc in next, 1 sc in next, rep from * around, Sl st in next and fasten off. Weave in ends. I have been crocheting for a long time. I know this is an easy pattern. When I make mine they come out flat. I am going through the back loop. Yours look so nice and fluffy. What am I doing wrong. I have tried different sized hooks. Thanks so much. Thank you so much for taking the time to respond to me. I am adding the last row. My middle part does not stand up like yours looks like in the picture. I just had some peaches and cream with me on vacation. Could it be the yarn? Thanks. So happy to hear that, Diane!! Love this pattern! I think I’ll make several for Christmas presents.I wanted to purchase the supplies from somewhere to help support your blog. But I was unable to find the affiliate links. Hello! Are these supposed to be small or big? When I made them, they turned out to be pretty small. How big are the ones you made? Thank you! I love the pattern. Mine are about 3 inches in diameter. Kara – 3 inches is about right. That’s why I turned them into “flower” hair twisties by adding some beads and hair elastics. Love these! Added a hair twistie for my granddaughter to use as a ponytail holder. Since they are a bit small, it would/will be easy to make it bigger by just continuing the base until you get the size you want. I made some of these for my Mom to add to Easter bags. I made a plain circle and sewed a back to these so you just put two fingers in the “pocket”. I think it will make them a bit easier to use. Thanks for such a cute pattern! Great little idea. Quick and easy. And it’s great for both a facial puff and an embellishment. I’m even thinking of trying this in wire as a brooch. Here’s a simple little add on you may want to consider for the facial puff. A little handle to slip over the fingers. Leaving a tail for sewing, CH 9; SC in 2nd ch from hook and each ch across; CH 1; turn; SC in each sc across; finish leaving a tail for sewing. With a tapestry needle, sew the ends of the strip to the unused loops of the final round. Weave in ends and trim. Thanks for a neat stash buster project. mine didn’t turn out right. it just looks flat. am i missing something? do i complete rows 1-4 and then fasten off? how do i add the extra loops if i don’t use the magic circle? Hi Diane 🙂 The “unworked loops” are not effected by the magic ring at all. If you don’t want to use the magic ring, you can chain 2 and then work the first round in the second chain from the hook. The rest of the pattern will be exactly the same. Hi Kaitlyn 🙂 When you work the circle for the first part, you are only working the stitches in the back loop. This leaves the front loop free for the second part in which you would join your yarn into the first free loop at the center and then work around. Hope that helps! Hi Sherry 🙂 For this particular pattern, you can ch 2 and then work the first round of stitches into the 2nd chain from hook. Hope that helps! 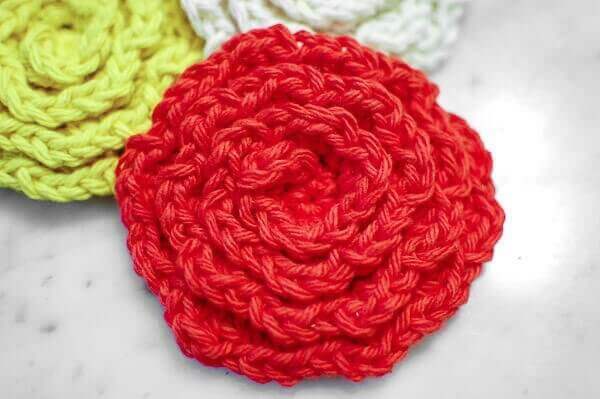 I really like this pattern and i knows its super easy to make , but when i make it doesnt swirl like a rose, i dont understand this step about joining,where am i to go if i dont join? Hi Jamie 🙂 Instead of joining at the end of each round, you just continue crocheting in a spiral. In other words, just start the next round as you usually would but without joining the previous one. This will give you the swirl effect. Make sense? I love this pattern. I found it pinned on Lion Brand’s Pinterest page. I will be linking to this post from my blog on Tuesday, July 16, 2013. Not much of a “crocheter” so anyone able to convert to knitting? Thank you for writing such a clear pattern, I have made four just this morning for my sons teachers end of the year gifts! I love the star pattern you have in the center of the top banner at your website. Do you have the instructions for that star pattern? I really want to try it. Thank you in advance for your help. By the way, I LOVE your new website! I can tell you switched to WordPress, didn’t you? It’s so nice! This is gorgeous Kara! I love that you made them for your girls. Thanks for sharing at Hookin On Hump Day! Hi Kate :). This circular pattern is worked in a spiral so you do not join at the ends of the rounds. You just work the next rows’ stitches right in the ones from the previous round. Rounds 1-4 of the pattern are the base of the pad. The flower effect is put on after Round 4. Thank you so much for your reply, I am sure you are very busy and for you to take the time to try to help me out really made my day. They turned out great, and were much easier to do than my brain was originally making them… Have a great day! Thank you so much for your party! I was wondering if I could share your post on my blog, It’s so great! Of course with a direct link to your blog. Glad you like it!! That would be great :). You are welcome to reprint one of the pictures but please link over to my post for the pattern. Thanks!! Are they suppose to be small? Because mine turned out pretty small after I finish round 4. Also I’m not quite getting what to do after that. Yours look great though, they’re supper cute. Unfortunately I don’t have a video tutorial at this time, but I can try to help. Which part are you having trouble with? These are Great! I make several different face cloths and scrubbers,,, but these have to be the cutest! Wow, these look great! A perfect little cotton yarn project. Thanks! They were so much fun to make too 🙂 Thanks, ChiWei!